A Los Angeles based company has just announced the reception of an angel round of funding. TechCrunch reports that the funding is in at right around $750,000. The main idea of the company is to have not only book reviews but to base the book reviews (via social network) around friends.With the main premise that you would find a book review from a friend more useful than from a stranger. There premise makes sense, in taking the time to read a book these days I couldn't care less what random people think about it, I would only take advice from friends, family, or just pick a book out of my own choosing. Secondly we all know the possibilities when 2 Stanford Graduates get together on an online project. In all seriousness there are some real good signs for this company; in around one year they have over 600,000 users and 10,000,000 book reviews, they are close to profitable, and best of all they have done all this without any formal funding. 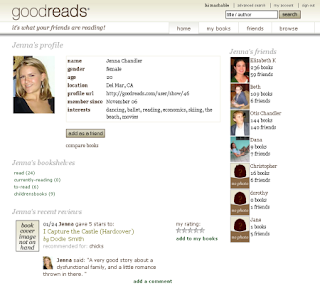 GoodReads has some stiff competition in Shelfari and Library Thing, and while I cannot claim that I am a member of any of these book networks I actually think that Shelfari looks a bit sleeker in terms of design. However that could easily be attributed to their association with Amazon and there plethora of funding. Also while I did find Goodreads easy to use I did not like seeing the reviews being pulled directly from a data base and having no personal oversight of this. What I mean by this is that you will have "Old Man and the Sea" reviews separated because some people are reviewing the paperback and others the hardcover even though they are the same book. What I found annoying about this is to get a good number of reviews you have to take the extra step of looking up 2 "different books" even though the story is identical. All in all GoodReads shows a whole lot of promise, they have accomplished more in one year without funding than many companies with years and millions. They are rapidly growing and I believe that if they use their funding wisely they will be in an excellent position to be the dominant book review social networking site.